One of the next best things about Christmas is definitely the leftovers. Sure, they taste really nice as they are the next day too, but it’s more fun when you use a little bit of imagination and give them a new lease of life. It’s no wonder that there are so many leftover turkey recipes out there. 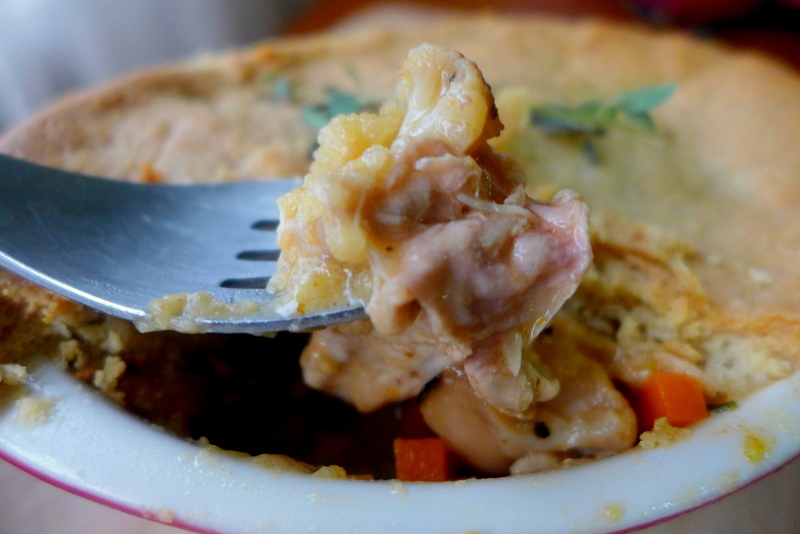 This year, I’ve turned my turkey into a delicious Pot Pie. 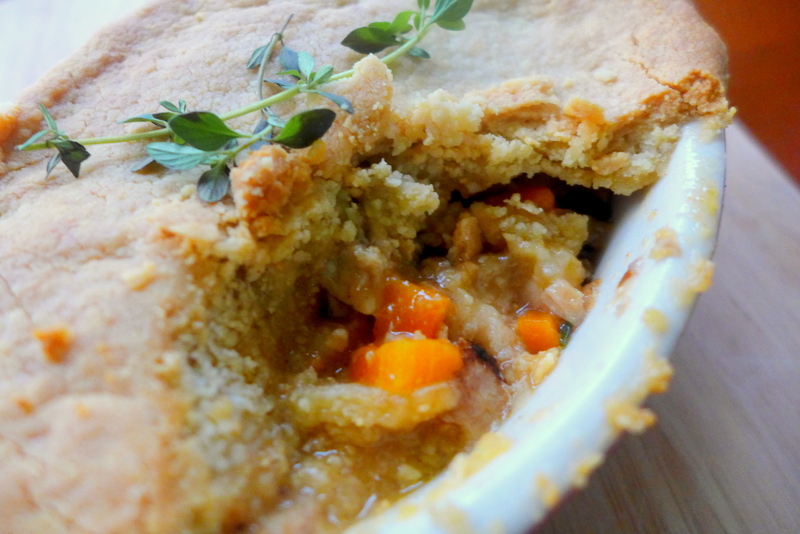 And this is no ordinary Pot Pie as it’s also gluten free and dairy free, aka Paleo friendly. Since I started trying to eat Paleo, I have kinda stopped making my own pastry. My flour section has been abandoned apart from the occasional use of almond meal. However, for this pot pie I tried a pastry using entirely almond meal and was pleased that the pastry held together pretty well. It does have a different texture compared to gluten version, and goes a bit crumbly when you poke it, but fortunately the taste is great. Most important it is delicious with the comforting filling. It goes without saying you can subtitute the vegetables as you please, and you can definitely make this with chicken. I had some leftover Spiced Cauliflower Salad and decided to throw that in as well. Yum! In a large pan, heat olive oil and add onion, garlic and carrots with a pinch of salt to sautee until soft. 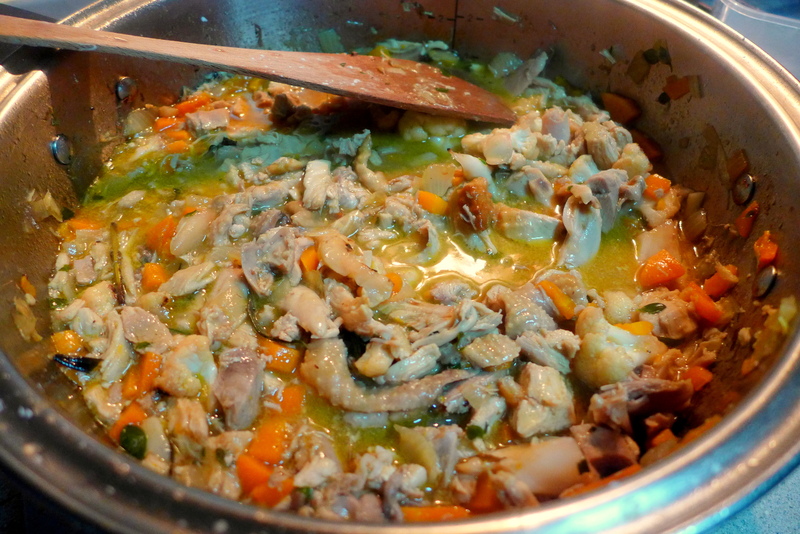 Then add the Turkey chunks, chicken stock, cauliflower, leftover gravy followed by thyme and cayenne pepper. Cook for around 15-20 minutes. Make a slurry with the potato starch and add to the mixture. Cook for few more minutes until the mixture thickens. Remove from heat and set aside to cool. Meanwhile, add almond meal and salt in a bowl. Cut butter into small cubes and rub into the almond meal until mixture resembles breadcrumbs. Add a little water so the dough come together. Flatten into disc, wrap with clingfilm and refrigerate for 20-30 minutes. When the dough is ready, pour the pot pie filling into a ramekin or small baking dish and seal the pastry around the top. Then place in freezer for further 15 minutes. 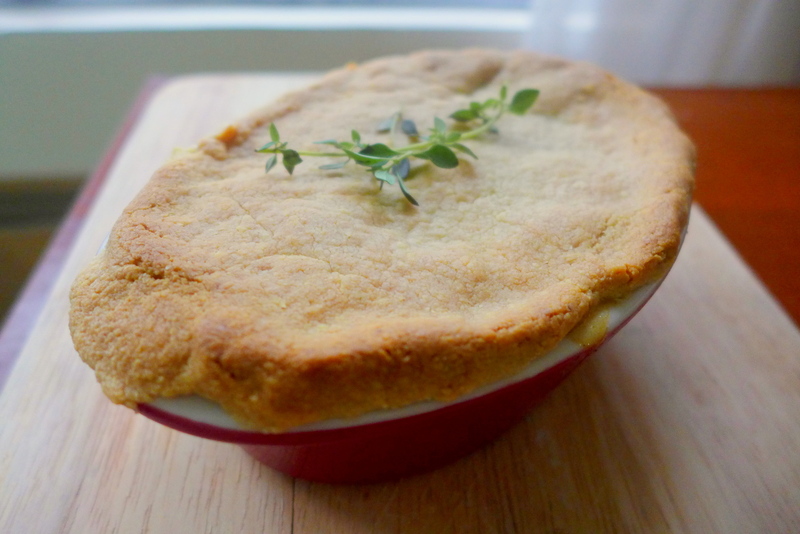 Preheat oven to 180C, and bake the pot pie for 20 minutes or until the crust is golden. Let cool for 5 minutes before serving. You can see that the texture is more cookie like here. Luckily that was all for me! I’m only sad that I have no more turkey left and have to wait another year for this! What have you done with your Christmas leftovers? I am submitting this to the “Baby Sumo’s Christmas Recipes Collection 2013” event. Yummmmmm!!!! That looks soooo good! Didn’t get to make more pies with our leftovers – the after-festival adrenaline drop, did not feel like it. Or in one word, lazy! LOL!!! Hahahahahahahahahaa but you had pies beforehand so it’s ok! Usually we have leftover beef from Christmas but this year we had steak – so definitely all gone!